My name is Markus and I’m a student of the university of applied sciences in Kufstein – Austria. I am seeking your assistance with my Master's thesis, where I examine the influence of ambient temperature and humidity on the success of 3D printing. Since I need a large number of experiments that are carried out under different climatic conditions, I would like to ask you to help me with this. I developed a test object with elements of the standard DIN EN ISO ASTM 52902 and additional features. I would send you the STL file of the test object, description of the settings for the experiment and a test report for evaluating, if you contact me. Additionally, I would be happy to hear about your experiences with the influence of different room temperatures and humidity values on the result of 3D printing in case you have findings that you would like to share (i.e. limits, critical environment, reliability). I won't have time to do tests, but from experience I can say a few things. For PLA, which is the most common material, bonding to the glass is affected a lot by moisture, when printing directly on bare glass plate without any bonding aids like glue. In a super-dry environment (e.g. freezing cold winter weather), bonding on clean bare glass is reasonably good. On very wet spring days, thus high humidity, bonding is very bad in my experience. Wiping the glass with *salt water* greatly improves bonding when printing on bare glass: it gives good bonding when hot, but no bonding at all when cold (=easy to remove models). The use of glue (dilluted wood glue, glue stick, hair spray, 3D-lac, etc...) also eliminate or reduce the effect of moisture on bonding. Printing quality of PLA is not, or very little, affected by moisture; I haven't seen any difference. I haven't seen much influence of environmental temperature, which in winter usually is 20...22°C in my lab, and in summer up to outside-temp, usually 20...26°C, occasionally 30...35°C. For moisture-sensitive materials like nylon however, quality will be greatly affected by moisture, but I have no experience with these, so I can't comment on that. I believe the quality of your test model is going to depend far more on the print-settings than on the environment, at least when printing in PLA, PET, or similar. 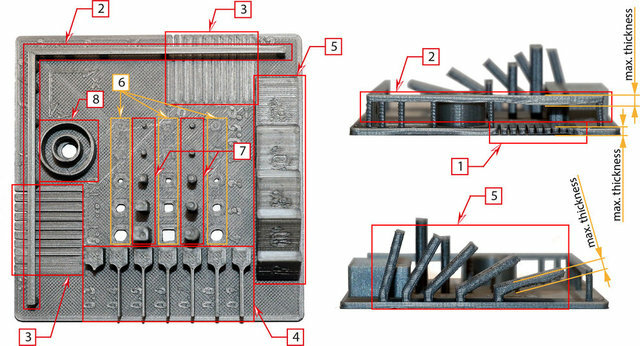 For example, quality will depend a lot on: bed temperature, bed bonding technique, glass cleaning method, nozzle temp, layer height (especially for overhangs), printing speed, material flow, cooling air flow (fan percentage), infill percent, support settings, cooling time per layer (with or without additional dummy models to increase layer time), and various other settings. And on the stiffness of the material itself when cold, and on the viscosity of it when molten. For printing nylon and similar materials, some sort of dry-box to keep the filament dry during printing is required anyway, just like drying methods are required in nylon injection moulding. @geert_2: Thank you very much for your detailed answer. I agree with your statement that there are many more factors influencing the success of 3D printing. I noticed in our lab that the same 3D print, which has worked quite often, suddenly stopped working in winter. The same G-code file / parameters were used. After the 3D printer has been moved to a different location (-> higher room temperature), the print has worked again. I hope through the experiments to find out if my assumption is right or wrong. Then the search can be deepened or going on in another direction. In order to take up your statements in my master thesis, I have to quote "scientifically", but forum contributions are not allowed. A possibility would be as a result of a survey or expert interviews. Could you give me a brief description of how you acquired your expert knowledge or came to the conclusions? Thank you very much, I highly appreciate it! How I came to the conclusions is simple: by printing thousands of models during the past 4 years, and by trying lots of different things. I wouldn't say I am an expert, but "advanced user" would be more appropriate. The experts are those who invented and developed the 3D-printers themself, and who worked with allmost all available technologies. Which I didn't. But I do understand your concern. Working at a university myself, I know the rule: "A publication is only considered scientific if it has lots of references to other publications that are already known established scientific publications." However, I think this is not how reality works: the really big developers, scientists and inventors of the past, did everything by themself. Think of Newton, Keppler, Volt, Watt, Tesla, Einstein, Mendelejev, and so many others. They were the first to do it, so they had no list of scientific references to refer to. They invented or discovered it all. Which in my view does not make them less valuable or less scientific, on the contrary. Info on new technologies these days is often only available on specialised forums, or small specialised developer groups, before the rest of society jumps on the bandwagon. So there are no "scientific references". This is a problem the "established scientific world" will need to address.